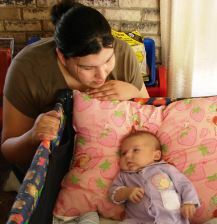 When Adrianna and her husband Eddie welcomed Desirae Clarissa into the world, they were grateful for the baby-care items they received from NPRA. Members of the Oglala Sioux Tribe in South Dakota, the pair has two other children. Family comes first for Adrianna and Eddie. Although they lived and worked in Texas early in their marriage, they returned to the Pine Ridge Reservation after Adrianna's grandmother had a stroke. Later, they took in the five-year-old daughter of a relative who was unable to care for her. Although Eddie works as a ranch-hand, money is always tight. Adrianna says the baby basket had all the supplies she needed when she came home with Desirae, even soft baby washcloths and tiny nail clippers. Perhaps the most valuable item for Adrianna was the disposable diapers. Although she tried cloth diapers, her children developed serious rashes. With high costs in reservation stores, she spends more than $150 per month on diapers for her two youngest. Adrianna also earned a portable playpen/crib from NPRA by attending events for new parents offered by the tribe's Healthy Start program. With the help of NPRA, she and Eddie are able to fulfill their commitment to their extended family.